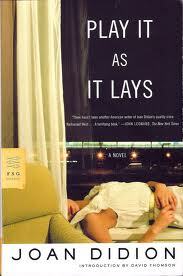 Albert Camus goes to Hollywood in Joan Didion’s celebrated 1970 novel, Play It As It Lays. The story concerns Maria Wyeth, a 31-year-old movie actress of small distinction, as she suffers a vaguely defined emotional / moral / existential disintegration. Nothing is going well in Maria’s life. Her marriage to a film director is falling apart. Her young daughter is institutionalized because of a severe psychiatric disorder. Maria is not working because – at least it seems to me – she is suffering from a debilitating combination of depression and anxiety. She terminates a pregnancy that results from an adulterous affair and is then haunted by the choice. And through it all, Maria becomes more distant and indifferent, until she can no longer find any meaning in her life or the lives of the people around her. Play I As It Lays is composed of 87 fragment chapters written in a elliptical style that largely focus on its characters’ external actions. Didion names Hemingway as one of her influences, and it shows. Both novels concern a character that sees life as essentially meaningless. Both characters commit a crime. In the case of Camus’ Meursault, it is the famous murder of an Arab man he encounters on the beach. In Maria’s, it is abetting the suicide of a friend who shares her bleak view of life. Meursault is imprisoned for his crime. Maria is confined to a neuropsychiatric hospital for hers, although whether this is the result of legal action or medical judgment or her own choice is not defined. Both are, overall, reasonably happy locked up. Both Meursault and Maria Wyeth can be seen as monsters or truth-tellers. Both are viewed by other characters in their novels as selfish, self-absorbed, or evil (Maria addresses the question of evil directly in the opening sentence of Didion’s novel) although I don’t think Meursault and Maria are selfish as much as they are as indifferent to their own lives as they are to the lives of others. Both seem to have one single authentic human connection: Meursault tenuously to his mother, Maria to her daughter Kate. Both novels have a desert setting (Play It As It Lays takes place as much in Nevada as Los Angeles). Both books are written in a clear, brief, terse, and unadorned style. Both Play It As It Lays and The Stranger also possess a serious flaw, to my mind. In Camus’ novel, it’s my nagging sense that Meursault commits the murder less from psychology or situation than from Camus’ need for him to commit the murder in order to advance the story. It’s a senseless crime, but it’s motivated neither by an irrational burst of emotion, or carelessness, or anything else I can see. In Didion’s book, the flaw I see it that Maria Wyeth seems to suffer constant, intolerable emotional pain while at the same time acting with utterly indifference to her life. These are mutually exclusive states of being. And while the exclusion doesn’t have to be absolute, I’m not sure Didion resolves the contradiction. What is the nature of Maria Wyeth? This is one of the more interesting questions a novel can ask about its main character and the best ones often answer it in unsettling ways. Emma Bovary, for example, is a puzzling and off-putting and challengingly shallow literary character. Can we really take her as a successful simulacrum of a potential actual person? Because a profound occupation with the nature of humans and human life is the essential foundation of the novel, despite what theory geeks and academics might insist otherwise. On first reading, I thought Maria Wyeth was a successful simulacrum because the novel is written retrospectively. Play As It Lays opens with Maria in the neuropsychiatric hospital with all the book’s action already in the past. So the coldness and distance with which the book narrates Maria’s descent make sense: she’s simply withdrawn from pain that would otherwise have destroyed her. The novel’s quick shift from the first person in the first chapter to third person – “a third very close to the mind of the character” as Didion described it in a Paris Review interview – also makes sense because it makes the distance between Maria and her experience greater. I read all this and I said to myself, “The lady doth protest too much, methinks.” Or is it brags? Now it is possible that Maria Wyeth, the self-proclaimed Queen of Nothing, at the same time, and with equal sincerity, desperately wants to get out of the hospital, save her daughter, and live with her. Quite possibly she wants nothing and feels nothing, except when she doesn’t. Holding mutually exclusive convictions is a human trait. In fact, it may be THE human trait. It also human for a person to regard her experience, insight, and suffering as well as her resilience in the face of these, as unique and remarkable. Arrogance is another common human trait. But I don’t see where Maria gets her arrogance. She is barely able to hold herself together in the novel from one moment to the next; and yet at the end of Play It As It Lays, we are supposed to believe that Maria has faced and transcended the devastating truth of life nobody else has the capacity to see much less the strength to withstand? I don’t buy it. I’m not convinced. And because I’m not convinced, that makes Maria, not a simulacrum, but a conceit. Simulacrums speak for themselves, but conceits speak for their authors. And Maria Wyeth does not speak well for Didion. Part of my reaction to Play It As It Lays is informed by my response to A Year of Magical Thinking, which I thought was a fine book, and made me feel sympathy for what Didion suffered, but which also set my teeth on edge because Didion wrote about the deaths of her husband and daughter in a way that seemed to imply her observations and feelings were unique. (My father said to me spontaneously about the book, “Does Didion think no one else has ever lost someone they loved?”) We could ask a similar question about Maria. Then also, I’m sensitive to the unspoken conviction among writers and readers that a habit of introspection and a (sometimes) talent for expression gives them a finer soul than normal people. These qualities don’t, although they are often the parents of a particularly offensive and repugnant form of vanity. In its negative form, this vanity will suggest that if you are happy, you aren’t paying attention. Now that intemperate outburst may lead you to conclude I didn’t like Play It As It Lays. But I did. It was well written and challenging and gave me a good workout. I had an interesting conversation / argument with Didion as I read it. Can’t ask for too much more than that.